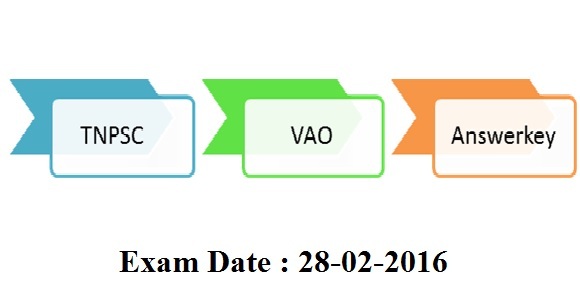 TNPSC VAO Exam 2016 was conducted on 28th February 2016. TNPSC is one of the most popular examination in Tamilnadu which is applied by about 10 Lakhs Aspirants this year. The VAO Exam 2016 Notification was published on 12-11-2015 for the total vacancies of 813 Village Administrative Officer Posts. Tamilnadu Public Service Commission has set minimum age limit to apply for the VAO Exam as 21 Years and the educational qualification as SSLC / 10th Pass. Since, the education qualification is 10th Pass, the VAO Exam get more competitors thant the other examinations. TNPSC Official Answerkey expected to be published with in one week of the VAO Exam Date (28-02-2016). But, if you are eager to know your answerkey just after writing the VAO Exam 2016, you can check the TNPSC VAO Answerkey of Popular TNPSC Coaching Centres of Tamilnadu like Appolo Study Centre, NR IAS Academy, Radian IAS Academy, Vidiyal Coaching Centre etc. After Checking the answerkeys please submit your correct questions in the following form to predict the expected cut off marks Click Here.